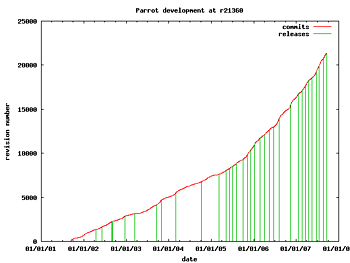 One of our developers, Paul Cochrane, has generated a graph of the frequency of commits and releases in Parrot over the history of the project. culling the "start of milestone" info listed at tpf you'll note the first payment date was april 2005. given that info, it becomes crystal clear that nlnet's money has spurred parrot development, and has allowed releases to occur both more frequently and more regularly. When Teus, Wytze, and I first talked, we hoped that the grant would erve to draw in new developers and inspire greater activity. It's good to see the evidence of it working.